What are your three must-have motorhome accessories? When going away in a motorhome or campervan, everyone has at least one motorhome accessory they simply cannot camp without – if not more! It’s necessary to pack all manner of accessories into your motorhome to make your trip that little bit easier or more comfortable. 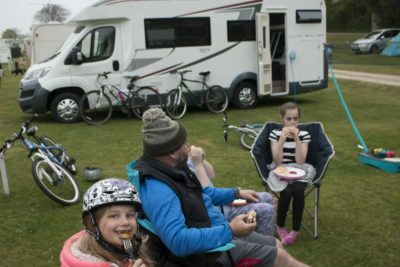 From the Sat Nav to get you to your dream campsite, to the levelling blocks for when you arrive, or mobile device to keep in touch, or an electric bike to explore your surroundings, to the kettle, barbecue, gas, outdoor furniture – the list goes on! In this month’s community poll, we’d like to know the top three motorhome accessories you cannot live without every time you go away. If we’ve missed your must-have motorhome accessory off the list then simply add it to the ‘Other’ box or share it with everyone in the comments section below. We’d love to hear any stories you want to share too and we’ll report back the results in May. I agree with people above who are pointing out that a lot of things on this list would be a necessary not a accessory? It depends is the usual answer! what is the weather forecast, which country are you camping in and what time of year is it? There is no point in taking a barbecue in the UK winter, that is useless, you need the TV and if you are touring in France then you need a satellite TV and electric hookup. If it is summer in the south France the you need the BBQ, the outdoor furniture and the awning to keep some of the fierce sun off. Sorry but the question as put is meaningless and the results likewise and unhelpful. Many items are not what I would call accessories, either standard items or just not an accessory at all. I know its just a bit of fun but putting wife as accessory is really verging on the insulting. The items near the end have been added by our voters. We have not added husband or wife. Not sure why there is only wife, husband and not a partner option, the LBT community does also have Motorhomes and caravans but it looks like caravan guard are not catering for them. Hi Phil these have been added by voters as an “other” vote – they were not options we specified – so feel free to add partner. Sorry if this has caused any concern. Ever tried automatic levellers and air suspension .Briliant when you have an arthritic hip.Good fun too. The dog! But seriously, thanks for the article, as a newbie it’s useful as a checklist. I agree. I was going to fill the form in, but having things like kettle and electric seems daft. Thanks for commenting Pat. Appreciate some of the items are necessities. Feel free to add in other items you feel should be included. Many are necessities not accessories. The choices are therefore confusing. Sorry for any confusion Philip. It can be quite difficult to differentiate necessities and accessories.